Pauseland's debut album, simply entitled Pauseland, was released on 10 November 2006. Released on 1 February 2008. Released on 7 April 2015. » » »A unique album. This music is both melancholic and lively. The compositions are simple, yet profound. It has a certain nerve, that makes Palindrome a delight for delicate ears. 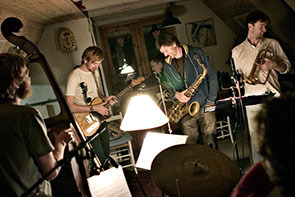 Pauseland is one of the most original ensembles in Danish jazz. 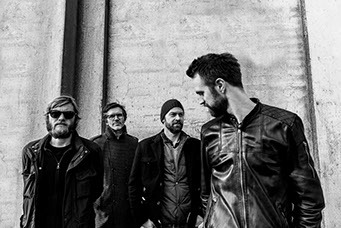 »For those that prefer their jazz tinged with autumnal nostalgia, Denmark’s Pauseland has delivered the goods. This eerie chamber-jazz ensemble uses words like effortless, interwoven, intimacy, and transparency to describe its music and they are 100% accurate. These cats have mastered an urban methodology for creating reminiscences of pastoral landscapes. But they’re not just striving to dwell in the domain of yesteryear, either. The round and liquid guitar tones, like those of Bill Frisell, Pat Metheny, or Marc Ribot, sound classic, modern, and timeless all in one touch. And occasionally Pauseland will employ looping devices to weave lush, ambient tapestries that hang on a melodic line in the background, blowing to and fro, haunting the distances. Sophisticated and militantly understated, Palindrome is an expressive album devoid of flashiness and tasty as hell.